It's so easy to completely lose sight of what's right in front of you. That's essentially what the partners of SC&P learned by the end of Mad Men Season 7 Episode 11, as they spent the majority of the hour fighting for their very survival, then reaching a level of acceptance only to realize they left a lot of people out of the equation. Jim Hobart earlier told the partners he was sick about the way things were handled and as the employees walked away downtrodden and defeated without even hearing Roger out, I'm sure they would have loved the opportunity to say the very same thing. With three hours left, it's hard to know what this means to everyone. For the partners, with the exception of Joan who was mentioned as one of the five but not specifically given an account, if they wanted to get back to advertising and take off their managerial hats, this may be their chance to shine. I don't think you understand what's happened. It's done. You passed the test. You are getting five of the most coveted jobs in advertising and all of the resources that go with it; travel, adventure and international presence. I shouldn't have to sell you on this. You are dying and going to advertising heaved. Buick. Ortho Pharmaceutical. Nabisco. Coca Cola. Stop struggling. You won. It makes sense McCann Erickson wouldn't want to keep two full firms up and running, but they never made that a condition of their agreement when they merged. Somewhere the partners always thought they'd retain their identity until their four years were up. To that end, it meant a last ditch effort – thanks to Lou quitting to follow his dreams of cartooning to Tokoyo – of retaining clients and working out of SC&P West. They worked damn hard before learning it wasn't an option. It's interesting, because I was once an assistant one of the partners of a company about the size of SC&P and I was never in the dark. It was both a blessing and a curse. Like Pete, I wanted to tell at least one person, and confided in someone like Peggy who I knew well, who likely told someone else and so on, but never was I as in the dark as Meredith and friends. Considering the times, it's really surprising how well the guys can type and do their own office work, thus not requiring the assistance of their secretaries to maneuver through the meetings and presentations they were preparing. It never occurred to me until this episode how rare that truly was for the time period. So little by little word got around and the unfortunate thing about the rumor mill is people can make of it what they will. By time the truth was ready to be told, it was solidified in their minds. But would the entire company really make the transition? Jim said they'd have all the resources they wanted at their disposal. The can likely take who they want if they want, but the little people would be extraneous and unnecessary. As it ended, if people walk out, it makes it easier to move without having to fire people. That's sad, but true. Let those who don't love the opportunity make a rush for the exits and work with the ones who are left fighting for positions. They're usually worth the effort. Meanwhile, Don is still getting messages from Diana, but with instructions not to deliver said messages if he doesn't get them by a certain time. He gets a lot of calls from women like that. Roger admitted to Don he's in a long-term relationship with Megan's mom and after Don picked his jaw up off the floor, he congratulated him. What else is there to do? He probably realizes Roger is as crazy as Marie. 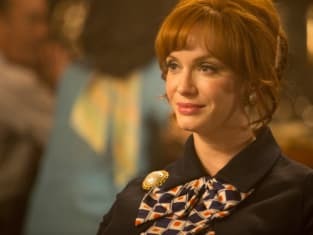 It sure seems like Pete and Trudy are headed toward reconciliation, Joan is firmly committed with Richard and Ted reconnected with an old college sweetheart. But my favorite lingering moment was between Peggy and Stan. It doesn't seem her fella from her drunken night will be making another appearance, and Peggy and Stan have always had a very close relationship. He's no longer with his lady friend and after the very odd interaction with a child actress and her mother, Peggy couldn't let go of the memory of her own child out there and the guilt associated with her decision. Peggy probably wouldn't call it guilt, because she's strong, but she's bothered by the fact she would be expected to label it at all, because she's a woman. And she's right, but it's still the way it is. A woman's connection with a birth of a child is different than a man's and she knows it. Peggy shared one of her biggest secrets with Stan. Because of who they are together, he didn't judge or react in any particular way. He was just there for her. It was perfect. Pete told Peggy about McCann because of their connection and because he needed to hear it would be OK. Peggy shared with she did with Stan because the timing was just right. She didn't expect a response. It got their friendship back on track again, however, and they were in that space where they just sat on the phone with each other, not wanting to be alone, comforted that the other was there. Knowing they have that friendship is enough for me. The previews for next week with glimpses into packing boxes and longing glances out the windows mean they will probably be saying goodbye to the Time Life Building for good. We'll find out who is staying and who is going. Will we also touch base with some other characters, such as Betty? We're getting so close. With only three hours left, only a time jump will allow Don to truly find happiness, but I don't think that's coming. What else could be out there? We'll find out shortly. If you need to catch up with the 70s, you can watch Mad Men online any time via TV Fanatic. McCann's moving us to their building. We lost our lease. Everything must go. Permalink: McCann's moving us to their building. We lost our lease. Everything must go. Peggy: They all have their own toy. If we want enthusiasm, we should just have one toy. Stan: Like a Battle Royale. Just throw one in there and the last kid standing gets the gig? You hate kids.